Instructional design builds upon my background in technical communication. In both roles, my focus is to provide information that others need to do their jobs competently and confidently. The knowledge, skills, and judgment I developed over decades as a Technical Writer and Illustrator transfer directly into the field of education and instructional design. Instructional design is more interactive with end users than technical communication usually is. For me, a key motive for expanding into the education field was to have more direct contact with my audience. Instructional design always entails measuring the effectiveness of instruction. 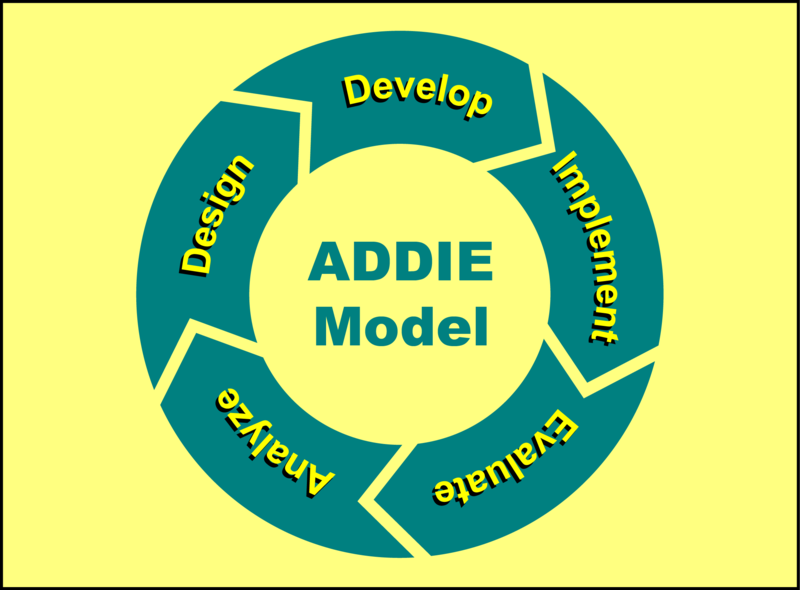 The ADDIE model is the best known among Instructional Systems Design (ISD) models. The ADDIE model identifies five sequential phases in a recursive instructional-design process, which begins with analyzing training needs and culminates in evaluating training effectiveness. Analysis begins with identifying the nature of the situation and determining whether inadequate training is a cause of problems in the first place. Analysis includes identifying the learners, defining learning objectives, and the subject matter to be learned. According to some sources, aligning learning objectives with business objectives is a part of this analysis, while according to others this alignment is a prior step. Design begins with a more detailed profile of the learner and establishes what learners may be expected to know already. Designing training involves constructing an outline for training, specifying a format for delivery, and determining the means for measuring success. In the design phase, which topics should be addressed in which sessions, the sequence in which sequence must be specified, and so forth. The outline should specify what portions must be created from scratch, what portions may utilize pre-existing resources, what portions should be instructor-led, what portions require demonstrations, and what portions the learners may be required to pursue on their own. The development phase involves generating course content as specified in the design phase. Development can include composing text, generating figures and other media objects, designing exercises to enhance learners' retention of course content, and developing instruments to assess learning success. The development phase should include rehearsals of lesson presentation, dry runs of computer-based components, and so forth. The implementation phase entails delivering or administering the training program developed in the development phase. Trainers should make careful observations of learner responses, noting the effectiveness of the methods and objects used to deliver content to the learners, and learners' reactions throughout delivery, especially during exercises. The purpose of the evaluation is to determine what revisions and refinements will make the training program more effective and efficient. In the evaluation phase, assessment results and observations from the implementation phase are analyzed to determine how effectively the learning objectives were achieved.